1st Walk in the Woods 2007! As part of our wedding vows, Warren committed to not only love, adore and put up with me, but he also promised to complete the Appalachian Trail, section by section, with me. Our goal is to complete 100 miles per year which should put us on the top of Katahdin in the year 2027. We've completed almost 300 miles to date in MD, VA, WV and PA. Last weekend we started our hiking season with a short 9+ mile hike in PA off of Route 325. We found Michael Gelinas (717-249-3718), our PA shuttle driver through The Appalachian Trail Conservancy. The ATC has a list of shuttle providers so that hikers can get on and off the trail or for hikers to travel with only one car and get dropped up the trail. We love Michael! He always comes prepared with wonderful thru-hiker stories along with some tales of ill prepared hikers. Male and female Scarlet Tanagers. BirdCouple loves hiking and birds! Cute Husband maintains the bird list, plans the hike, organizes the maps and carries the heavy stuff. I hike and look at birds. I wish I knew what this beautiful flower was. Reminder to myself: Pack wildflower book in Warren's backpack next time. Several hikers warned us of a rattlesnake den that was a couple of miles into our hike. That made us super cautious for a few miles wondering when a huge viper was going to spring out of the woods and sink his venom in us. This sign indicated the danger zone, but apparently we were the only hikers that day that missed hearing the tell tale rattle. We love it when we get the opportunity to meet thru-hikers. We passed several north-bound thru-hikers last weekend. We always pack some chocolate as "trail magic" in trade for some of their motivation and trail stories. We met this lovely couple (trail names GG and Rodo) in the last mile of our hike. They were into learning about birds and described the "tropical red bird with black wings" they had recently spotted. We showed them a picture of a Scarlet Tanager and Bingo! Warren and I will be cheering them on (they have less than 1,000 miles to go!) to Maine through their online journal. Their blog has some great pics of swamp foot, if you are interested in what happens after hiking for hours in rain. I wish I knew what these berries were. 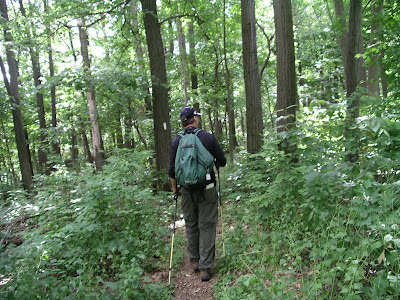 Note to self: Pack the Berry identification book in Warren's pack for next hike. 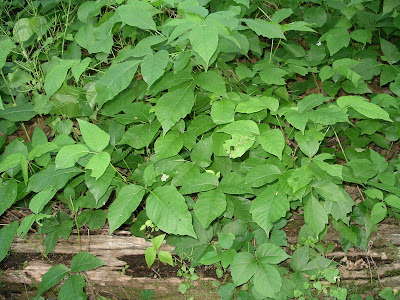 I don't need a weed book to ID poison ivy. A pair of amorous butterflies. I wish I knew what type of butterflies these were. Note: Next hike, pack butterfly book in Warren's pack. 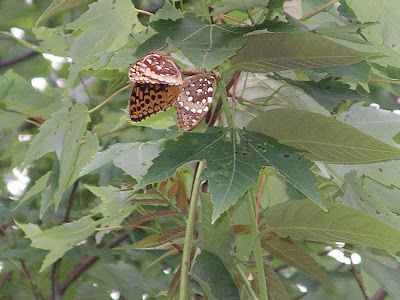 Great Spangled Fritillary Butterflies, with the female to the right. 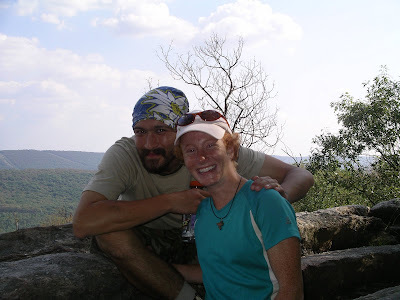 BirdCouple is planning (ok, Warren is planning and I am hoping) to walk a slice of the AT in VA in 2 weeks. Virginia is less rocky! Hooray! A nice rocky portion of PA! Can't wait to try out our new poles!